This application will allow you to use color charts in a Color Warlock format that can be loaded into the program and used to copy html hex color codes and other color types to use when coding. 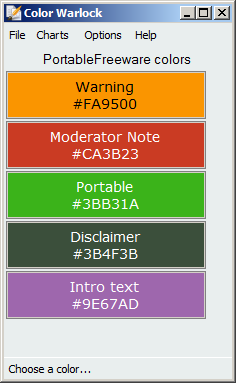 You can then share the color chart files with your friends or online to anyone. You can use the built in Chart Builder to create your own color chart files. Another amazing find from Baas. This is not just a program I'll use once in a blue moon when I'm doing graphics work, it's something I may start using on a daily basis for the site. What's missing from so many color tools is an easy way to grab and paste specific colors, but that's what the main window is designed for: to be a reference box that you can pull effective colors from. Left-clicking gives you the code (e.g. #EFDECD) while right clicking copies the name (e.g. Almond). Still, you don't really see the program until you open the "chart builder" from the File menu. That has some really effective tricks for getting and naming a good set. I'll do a bit of testing to get the colors right and then post the color palate XML file. I have some web developer friends that need to see this. License: Freeware, developer Carroll Dearstone asks that it's not redistributed. Chart Builder - Quick Edit is now just for the currently loaded chart. All other times you should be using the Chart Builder - New file menu item. Eye dropper is now a separate window accessible through a button from chart builder window. It will hide the chart builder while you are in it and it has a smaller interface than the chart builder window which is handy since not as much screen space is taken up. Optimized some code in various places of the chart builder. Fixed eye dropper with high dpi monitors. Please vote if you'd like to see it added. Nice tool! What I am missing so far is a color format like $000000FF ($00BBGGRR). Also an option for user defined formats would be nice. Same here. GREAT tool, extremely useful.